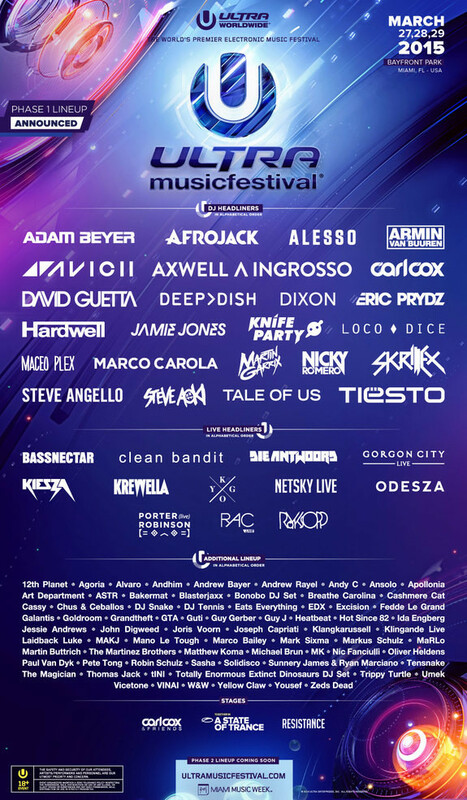 Ultra Music Festival recently revealed Phase One of the DJ and Live Performance lineup for its 17th annual edition, taking place on 27, 28 and 29 March, 2015 at the Bayfront Park in downtown Miami. Avicii will make his return to the newly designed Ultra Main Stage having missed his 2014 performance due to illness. Fellow countrymen Axwell^Ingrosso will be making their debut as a duo at Ultra Music Festival Miami, following their set at Ultra Japan in September 2014 and scheduled headlining sets at both Ultra South Africa and Buenos Aires in February 2015. To add to the Main Stage fun, the likes of Afrojack, Alesso, Armin van Buuren, David Guetta, Eric Prydz, Hardwell, Knife Party, Martin Garrix, Nicky Romero, Skrillex, Steve Aoki, Steve Angello and Tiesto will all return to Bayfront Park. As a festival that prides itself on providing its fans with a huge range of varying sounds and experiences, Ultra Music Festival has also confirmed acts such as Adam Beyer, Carl Cox, Deepdish, Dixon, Jamie Jones, Loco Dice, Maceo Plex, Marco Carola and Tale Of Us. Ultra’s live stage brings Grammy-nominated Royskopp, who will play Ultra for the first time since 2011 to showcase their recently released (and what they claim to be their final) studio album, while South African rap duo Die Antwoord, electronic group Clean Bandit and Canadian vocalist Kiesza will all bring a different energy to the festivities, as they take to Ultra’s flagship festival for the very first time. Perhaps two of the most eagerly awaited shows across the weekend will come from Tropical House pioneer Kygo and producer Porter Robinson, who will each bring their own array of eclectic sounds to the Klipsch Amphitheatre. CARL COX returns to the Ultra Megastructure for an 11th year, in which he will host Carl Cox & Friends across Friday 27 March and Saturday 28 March 28. Armin van Buuren will then take the reins of the Megastructure on Sunday 29 March, as he brings his Together In A State Of Trance’ show.